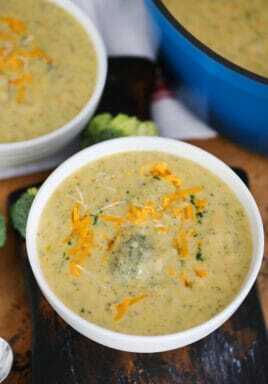 Broccoli Soup with Cheddar and Asiago is one of my favorite soups to make when it comes to colder weather. It is bright in color loaded with broccoli, making it the perfect hearty meal. 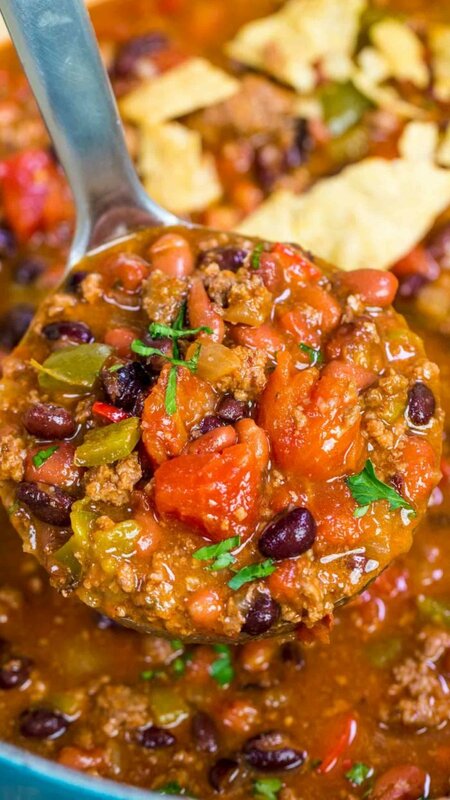 I love delicious and easy to make soups, and this one will not disappoint. Also, the fact that you make it in one pot makes it a lot easier. You can also try Kale Soup, Potato Leek Soup, and Chicken Wild Rice Soup. This broccoli soup has the perfect taste and balance. 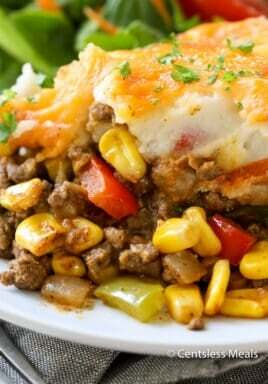 It is creamy thanks to the cheese used, yet also loaded with hearty vegetables. 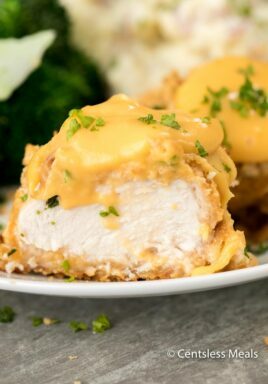 In addition, it is very easy to make, and ready in about 30 minutes. The flavors are deep and very satisfying. I love dipping into it because it is so festive, rich and thick. Once cooked, let it sit for another 10 minutes prior to serving. This will intensify the flavor, and also make it even thicker and more delicious. You can eat it as is, or enjoy it with a big slice of a French baguette on the side. 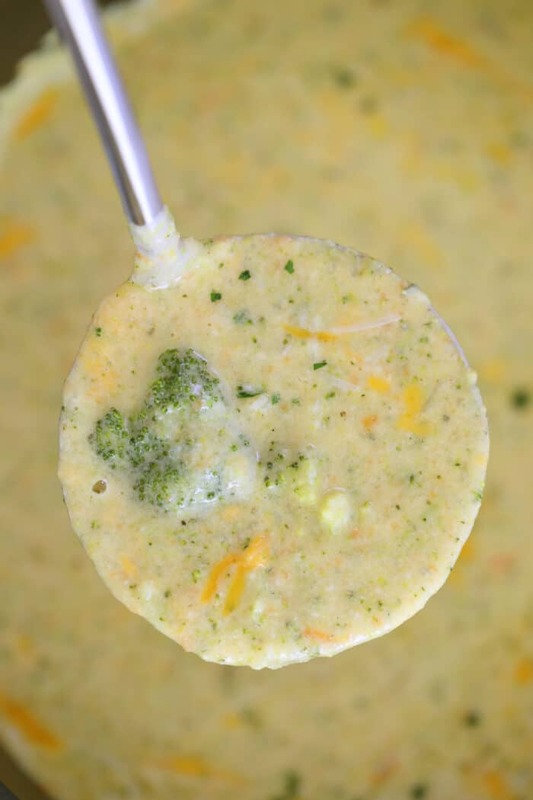 Is this broccoli soup recipe low carb? There are about 20g of carbs per bowl, which is on the lower end of the spectrum. However, you cannot call it keto-friendly. Because carrots are used, the carb content is higher. To reduce the carbs, you can omit the carrots. Also, instead of milk, use cream. Can I swap the cheeses? 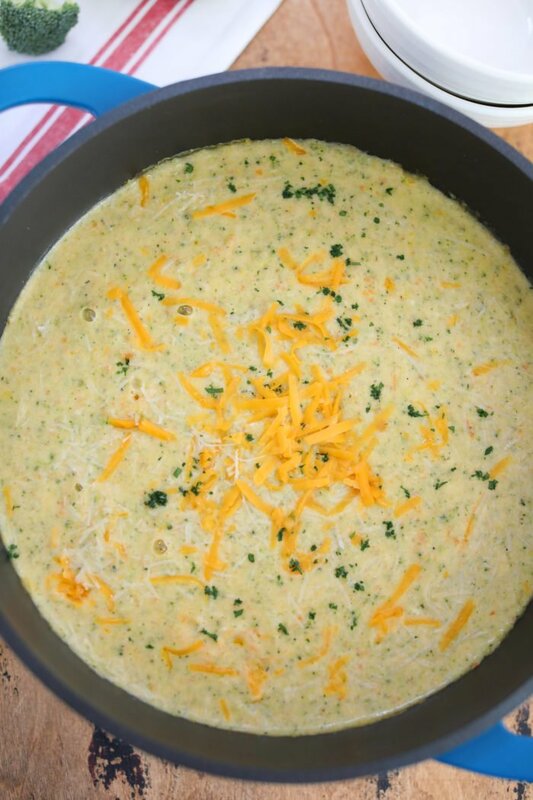 My preference is cheddar and asiago cheese for this soup, but you can substitute almost any mild cheese. For example, you could use Colby Jack or Gruyere. When buying the cheese it’s best to avoid pre-grated cheese. It is usually covered with an agent that will prevent the strands from sticking to each other. Unfortunately this same agent prevents the cheese from melting properly and smoothly. Therefore, grate the cheese yourself for best texture and flavor. Can you make this soup vegetarian? Yes! This is a great option and it tastes also very delicious. 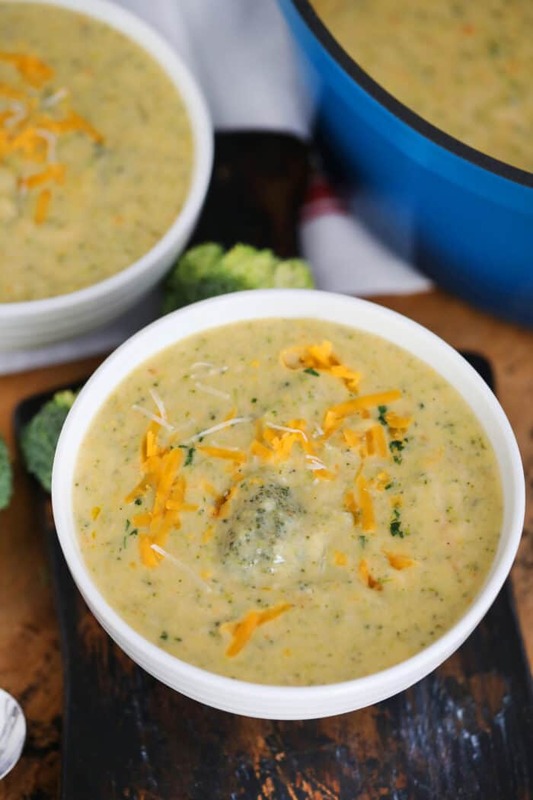 Simply, swap out the chicken broth for vegetable stock (or broth) and you’ll have a vegetarian version of this broccoli cheddar soup! This soup works best with fresh broccoli. Because frozen broccoli does not hold up very well after it has been frozen, it will have a mushy texture to it. Therefore, I do not recommend using frozen broccoli and always go with fresh. How to store broccoli soup? If you have leftovers, it is best to transfer to an airtight container which can be stored in the fridge for up to five days. Even though this is a cream soup, you can also freeze it. 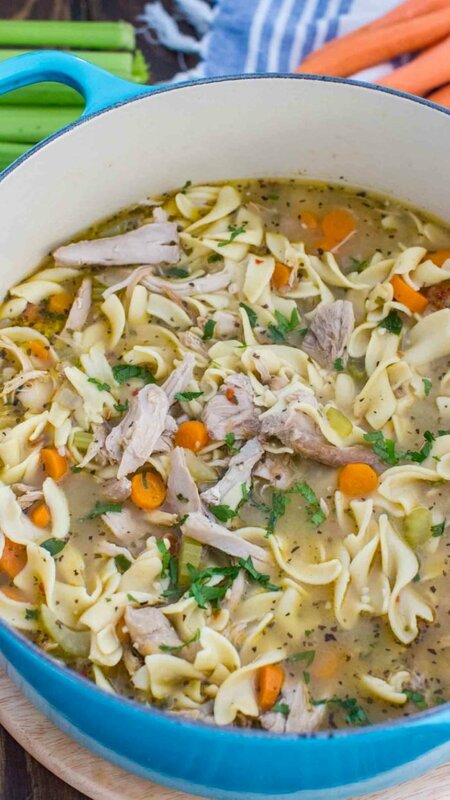 Before freezing, make sure the soup is completely cooled. Then, transfer the soup to an airtight container and store it in the freezer for up to 3 months. How do I reheat broccoli soup? It is best to reheat this soup on the stovetop over low heat, stirring frequently. Try not to bring it to boil, as it will cause the ingredients to separate. You can also add some cream when reheating, as it will give it a smooth texture. You can use other veggies if you like, or substitute broccoli with cauliflower. To make it spicier, add some red pepper flakes to it. Also, when stirring the soup, make sure to do it slowly and carefully. In a large saucepan or Dutch oven over medium heat add butter and melt. Add diced onion and cook for a few minutes, until soft and translucent. Add shredded carrot and minced garlic. Add diced celery. Add salt, pepper, and chopped thyme. Stir and cook for 4-5 minutes, until veggies are tender. Add chicken broth, stir and bring to a light simmer. Then, add broccoli florets. Simmer on low-medium heat until broccoli is softened, about 7-8 minutes. In the same time, in a small bowl combine milk and flour and whisk until smooth. Add the mixture to the soup and stir to combine. Simmer for 3-4 minutes. Using an immersion blender, blend the soup to the desired level of creaminess. Remove the saucepan from heat, and stir in cheeses until fully melted. 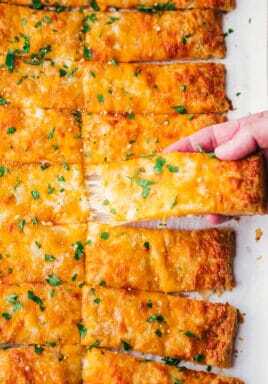 Serve immediately garnished with more cheese. This looks wonderful. Pinned. Thank you for sharing. I love broccoli and this look delicious!! I can’t wait to try it:) Thanks for sharing!